Early preschoolers learn to understand and express emotions in ways that encourage empathy, compassion and reduce the likelihood of hurting themselves or others. 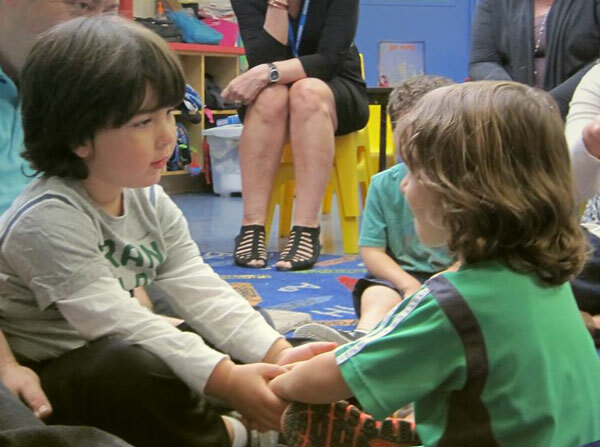 Early preschoolers play the emotions game. Recent experiences at our son’s early preschool with children acting out upsetting emotions in ways that hurt other classmates led my wife and I to ask permission to teach the three and four-year olds skills to better understand and express their feelings in ways that didn’t turn into bullying. Although I’ve taught these skills to thousands of people, including soldiers returning from war, couples in crisis, homeless adults, youth in inner-city high school, middle and elementary school classes, this would be the first time I’d shared the work with such young children. Checking out the exercise with Zachary, our soon to be four-year-old, the night before and again the morning of our program left me optimistic the PAIRS class would be understood by his young peers. The group of nine boys and three girls sat in a big circle with our four instructors as their teachers and school administrators looked on. After briefly explaining the “game,” we asked who wanted to play it with Zachary. Nearly everyone raised their hand. PAIRS Instructor Rebecca King helps children learn to color their emotional jugs. Zachary sat with a classmate, holding hands, looking into each other’s eyes, and began the lesson. A youngster colors her emotional jug. Finally, Zachary asked, “What are you happy about?” His friend responded, each time getting a “thank you” in reply. After five or six exchanges, the two preschoolers hugged and completed the exercise. The other children quickly paired up and did the exercise both as speakers and listeners. Having four instructors present to help was important. As they finished, the instructors sat at a table with the youngsters as they colored what their emotional jugs might look like. By the time we were ready to celebrate our experience over cupcakes 40 minutes later, feelings of friendship, empathy and compassion filled the classroom. I left the school with heartfelt gratitude for the experience, optimistic about the future for this group of beautiful, precious children, wondering what it could have meant to have shared this lesson with so many other youngsters whose pained emotions ended up leading them to hurt themselves or others.